Bach, Rachel. 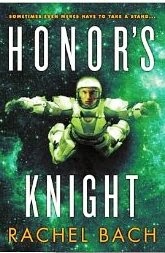 Honor's Knight. Orbit Books, 2014 (last week!). Recently I've been rather curmudgeonly about second installments (in trilogies or longer series), pointing out that almost none manage to equal, and astonishingly few surpass, the 'original' work from the first installment. How many Empire Strikes Back-level sequels have there really been, after all? But as various songs would have it, "This is it!" Rachel Bach (a.k.a. Rachel Aaron) charts a thrilling ride for Devi Morris and the reader, bringing her and us several giant steps closer to the clearly apocalyptic denouement looming just over the horizon (in book three if not beyond). She's managed to improve on the already excellent foundations laid in book one, ramping up both action and a sense of emotional engagement between characters (and between the characters and the readers) to dizzying new heights. Bach also delves deeper into the mechanics, so to speak, of the various races and their physical (and more ethereal) attributes, treating the reader to a fascinating and fully fleshed out rendering of their capabilities. And she's also brought a new level of attention to the possibility of shifting loyalties and alliances, even for Devi (who by her Paradoxian upbringing is a bit of a samurai, "Death before dishonor or betrayal" kind of loyalist). She finds new allies in the unlikeliest of figures, and friends turn into enemies and then into the intermediate limbo of frenemies with breathtaking speed. Yet Bach handles such situations with considerable care, ensuring the reader can follow such rapid changes in alignments without any difficulty accepting their plausibility. In fact, Bach even raises the philosophical level of her tale from relatively harmless rom-act (romantic action) in book one to a more serious "At what price (individual/species/universe) survival?" It is this greater level of nuance, more than anything, that humanizes both allies and frenemies alike, because as readers we instinctively sympathize on an emotional level with the romantics who insist some prices are too high to be worth paying even as intellectually we are forced to concede the logic of the utilitarians who insist that for the survival of the many, a few must be sacrificed...in short, there are no Voldemorts or Dumbledores, no simple paragons of good and evil, in this tale. That said, Honor's Knight never risks becoming too gloomy in tone or losing its (or, one might imagine, Devi's own) irrepressible sense of optimism, that classical Hollywood-esque feeling that everything not only might, it surely will turn out all right in the end. Whether you approve of this sunny quality will depend, of course, on whether you think the world is getting better or getting worse (let me just say, for all you committed pessimists out there: what evidence can you possibly have that the world is getting worse? And don't you dare say "because it's more violent/dangerous," because invasion of the Ukraine notwithstanding, humankind has never enjoyed such relative freedom from violence, on such a (nearly total) global scale, in all of recorded history!) And speaking of violence, Devi brings the goods: Honor's Knight contains plenty of good old fashioned awesomeness in the form of Devi using her fancy armor to devastating effect against a host of different enemies. Be that as it may, however, Bach really delivered in this volume, and she's got at least one reader who can't wait to read book three! Will Devi uncover the mystery of the phantoms? Discover how to restore the Daughters to themselves? Or just die in a blaze of (cool but ultimately ineffectual) glory? Given the inexorability of a happy ending, something tells me it won't be the latter! For more info on our scoring system--and thus, why an 8 is a fantastic score--see here!